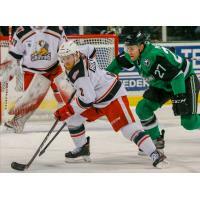 CEDAR PARK, Texas - The Texas Stars profited from four unanswered goals and Colton Hargrove's third-period hat trick on Wednesday night, earning a 6-3 win over the Grand Rapids Griffins in the H-E-B Center at Cedar Park. Three of the Stars' four unanswered goals were scored in a span of 1:44 in the third period, while Texas goaltender Landon Bow turned away 22 shots to put his home record at 15-1-1 through the past 17 games. Texas (32-27-4-3) earns two points with the win but remains seated at fifth in Central Division standings, as fourth-ranked Rockford also earned two points tonight in a shootout win over the Division-leading Chicago Wolves. Grand Rapids moves into a second-place tie with the Iowa Wild, trailing Chicago's point total of 82 by two. On Saturday, in their fourth game of six consecutive on the road, the Griffins (35-19-6-4) will close out their season series with Texas at 8 p.m. EDT. A roughing penalty gave the Stars a chance to jump on the board late in the opening period, as their power play ranks third in efficiency in the league. The Griffins' penalty kill stuffed the opportunity though, and Harri Sateri turned away all 10 shots of the frame to keep the game scoreless headed into the second period. At 9:29, six seconds after another Stars power play expired, Gavin Bayreuther found twine to give Texas the lead. Forward Justin Dowling whipped the puck out from behind the goal line and to the left-wing circle, where Bayreuther picked it up and angled it off the left post into Sateri's net. Grand Rapids eliminated the Stars' one-goal lead at 13:19 with the help of Turner Elson's 16th goal of the year. Immediately after Jake Chelios ripped off a shot from the left-wing boards, Elson tipped the puck behind Bow from the goaltender's right side, tying the game at 1-1. A Texas goal scored with one minute left in the frame not only rebuilt the Stars' lead, but also sparked a scoring streak that would result in the next four consecutive goals. A 2-on-1 left Texas forward Denis Gurianov streaking up the left boards in the Griffins' zone, and after dragging the puck through the slot, he snapped in a wrister to make the score 2-1 headed into the final period. Back-to-back goals from Colton Hargrove kicked off the Texas scoring initiative that would end with three goals in 1:44, starting with a power play goal at 6:18. With a break along the left-wing boards, Hargrove pushed past the Griffins' defense and slotted the puck behind Sateri to score the Stars' only power play goal out of five chances on the night. Just 1:25 after his first goal, Hargrove skated into the Griffins' zone alone, chucking the puck over Sateri's blocker for his second of the night. Texas forward Erik Condra capped off the quick scoring streak with a goal at 8:02, setting the score at 5-1 when he lobbed the puck over Sateri's right shoulder from near the left-wing circle. Joe Hicketts intervened with a goal of his own at 10:04 of the final period, notching his third of the season. Off a feed from Vili Saarijarvi near the right-wing circle, Hicketts threaded the puck over Bow's left shoulder to make it 5-2. Hargrove netted the Stars' final goal of the game at 15:20, unassisted, when he lobbed the puck into an empty net and secured his hat trick for the night. With 40 seconds left in regulation, Carter Camper tallied his 14th of the campaign. A pass from Chris Terry landed him close to Bow's net, and Camper popped it under the crossbar for the Griffins' third goal of the night. Notes: Sateri finished the night with 30 saves...The Griffins' power play went 0-for-2...All nine of the night's goals were scored over a span of 30:31.